Schumann @ Symphony Hills is a low density mixed residential development developed by UEM Land Holdings and located in the Cyberjaya Flagship Zone. It is also the first in Malaysia to introduce the concept of Connected Intelligent Community (CIC). This concept combines comfort, convenience, community and security within the enclave with high-speed fibre optic infrastructure. Correspondingly, Schumann intends to incorporate a smart solution into its design and is searching for an appropriate arrangement, as it wasn’t using any system yet. With this, the i-Neighbour Team decided to introduce our Smart Community Solution: i-Neighbour to Schumann. After extensively reviewing our solution, Schumann decided that our solution is perfectly suitable for its smart concept design because i-Neighbour has various handy features such as Announcements, QR Code Invitation and Walk-In Registration. Utilizing the Announcements feature, residents in Schumann can instantly receive updates online via Web or Mobile from the Management of the neighbourhood without having to physically approach the office for information. What’s more, i-Neighbour’s Invitation feature will likewise provide a QR Code to the visitors whenever they have preregistered themselves during the invitation process thus allowing for a safer and faster access at the guardhouse. Additionally, Schumann has deployed the i-Neighbour Guardhouse Tablet Panel for an even smoother registration procedure to be carried out as the tablet not only scans for the QR Codes but also comes with an Optical Character Readers (OCR) module that extracts relevant/important information from the visitors’ identification cards. As further reinforced by Ms. Siti Zubaidah, Treasurer of Schumann, “With i-Neighbour invitation features, we as residents are able to invite our own guest with just a few clicks”. 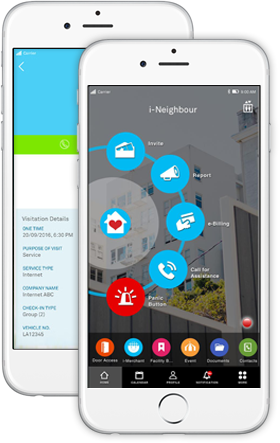 i-Neighbour is a Smart Community Solution that is applicable in high-rise residentials and gated guarded communities. Since everything is done in the cloud, Schumann can also expect much less paperwork which in turn will help them strive better in their goal to go green and preserve the environment. Check out the links below for more information about i-Neighbour and its extensive features.